This Illness Is The Cause Of Many Deaths Around The World! Do You Know What It Is? Sepsis is also known as septicemia. It is a life-threatening condition that arises when the body injures its own tissues and organs when exposed to an infection. It is always best to be on your guard and to know what the symptoms of sepsis are. There is also a condition known as septic shock which is a combination of severe sepsis and also a very low blood pressure. We all know that our immune system keeps degrading as our age decreases. This makes older people more prone to sepsis than the younger generation. Especially people above the age of 65. Sometimes, our bodies are composed of certain bacteria that restrict antibiotics working on our body. As a result, there is no method by which we can stop the disease from spreading. This happens to be the most common root cause. Finally, it is often observed that people who are affected by HIV or people who have had cancer treatments or have had transplantation, have reported weaker immune systems. Like we have mentioned above, a weaker immune system would mean higher probability of the infection occurring. Note: There’s a high chance that you might get in contact with sepsis if you’re too young. This is because, your immune system is not yet fully developed at such young ages. This makes it easier for you to get in contact with this condition. There are a lot of complications involved with Sepsis, especially the ones that concern blood flow. For example, sepsis could destroy the flow of blood to your brain, heart and kidneys. It also causes blood clots in organs such as our arms, legs, fingers and toes. This could eventually result in the failure of every part of the body, one by one, ultimately leading to death. I have personally experienced the silent wrath of sepsis in my life in the form of my grandfather’s death two years ago. Just when we all thought his health was perfect; he suddenly had an organ failure, after which he passed away. I could thus strongly say that sepsis is indeed is a silent killer, if not identified at the right time or not taken proper care of. 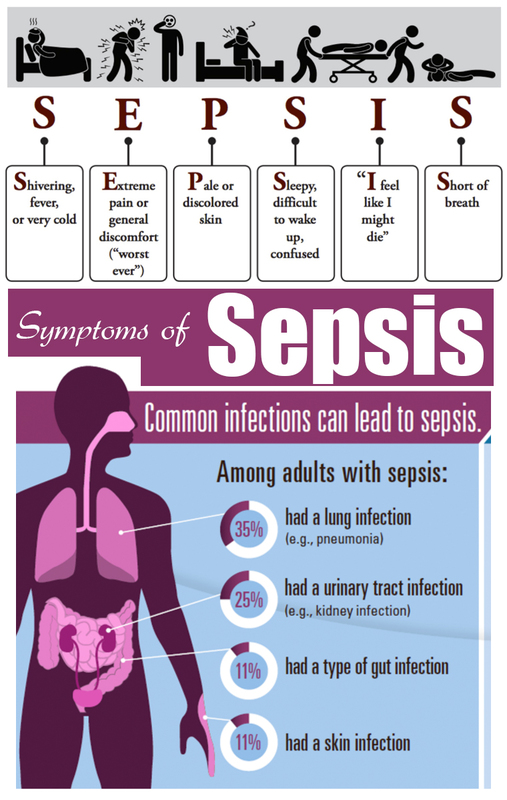 It is always better to consult a doctor, if in case you doubt that you might be experiencing any symptoms of sepsis. Levels of acidity in your blood. Wound secretion test: To check for any open wound infection. Previous article5 Easy Thanksgiving Nail Designs For The Last Minute Lady! Next articleYou’ll Be Surprised By These 4 Yoga Celebrities !! !